Hello guys, I'm here again with another charming app called ‘Opera News’ which also dishes out free airtime to users. Opera News is a news app with a powerful recommendation engine to keep you on top of all the things you love to read. Opera News delivers a variety of trending news and entertaining videos and gets smarter with each use. Do not be confused, it’s an entertaining app and not a browser like Chrome, though the app was developed by the same company that created the popular Opera browser and Opera Mini. In addition to delivering great content, Opera News can also save up to 80% of your data use thanks to our unique turbo engine. Try Opera News and spend less time searching for news and following your favorite football team, all while saving data! Some weeks back, they decided to launch a new system called “Referral“, to attract more customers to their apps and at the same time, they pay their customers for any user they invite to the app. This had made them broken the 1 million download milestone in less than four weeks since its release. 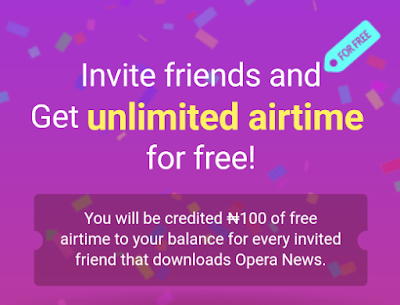 Opera News offers free N50 airtime when you first download the app and when you refer a friend to do the same, you get free N100 airtime while the person you referred gets N50. 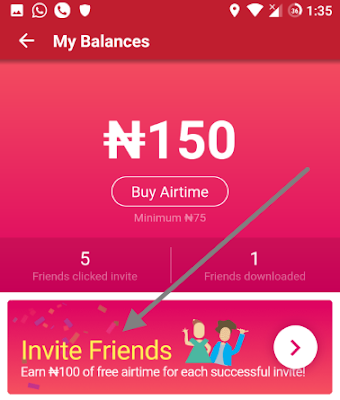 So if you can just refer 10 friends in a day, you will get a total airtime of N1000 at your disposal. Why worry about call card and data subscription fees? Simply download the Opera News Mobile App from => HERE. Allow the app to install, then open the app and you will be notified of your pending bonus, which will be received after a successful download. Open your Opera news app, go to your earning dashboard and tap on “Buy Airtime“, the enter your Phone number and select the amount of money to withdraw, then tap on “GO” and you will be recharged immediately through VTU. 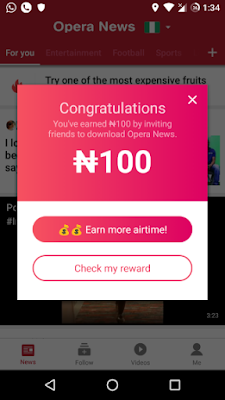 Open your Opera news app, go to your earning dashboard and tap on “Invite Friends“, then share to Facebook, Email, Telegram, WhatsApp or any other place of your choice. Opera News app is easy, convenient, fast and rewarding.